Guide your guests with a customized, annotated map you can easily email or drop into an event invitation. Summer is upon us, with plenty of events to plan and maps to make. 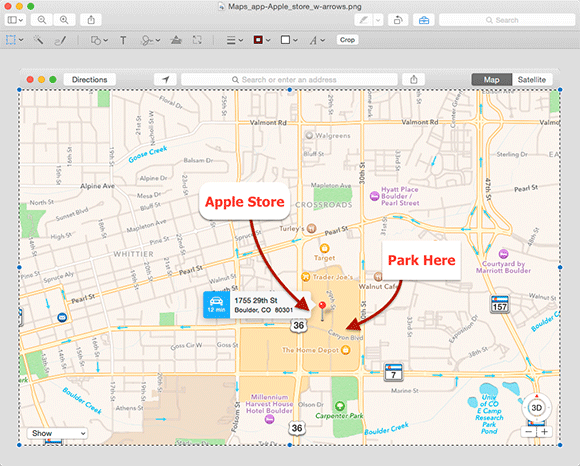 Providing a quality map with an invitation helps your guests, and your Mac makes them easy to create. 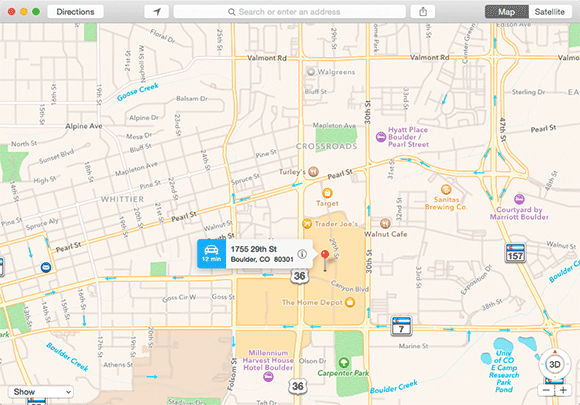 Using just three apps—Contacts, Maps and Preview—you can produce a custom map to print or pop into an email. Fire up the grill, because your map is just a few creative clicks away. If your event location is already in your Contacts app (say, a home or a business), find it by typing part of its name into the Contacts app search field. If it isn’t there, go ahead and add it. Click the label next to the address (it typically says home or work) and a shortcut menu appears. 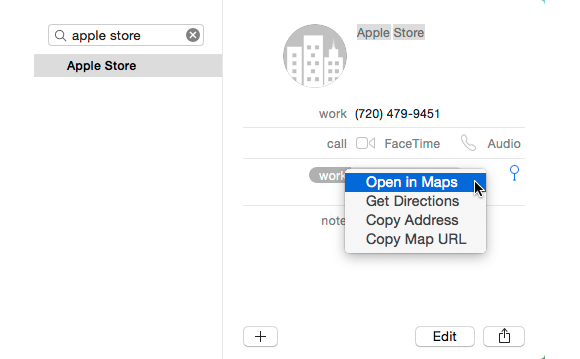 Choose Open in Maps, and the Maps app launches and pinpoints the address. Clicking “work” hides the address and reveals the menu shown here. Alternatively, you can point your cursor at the address and click the blue pin that appears at right. In the map that appears, your chosen address is clearly marked by a pin and a flag. The flag also displays travel time to the destination, but we’ll cover that up using some Preview magic explained later. Maps gives us a start for our map, but it needs a few adjustments. First, use the + and - buttons at the bottom-right to find a useful zoom level. Frame it so that major crossroads give your guests a point of reference. To make the street names larger choose View > Labels > Use Large Labels. If the location flag disappears, click the pin to show it again. 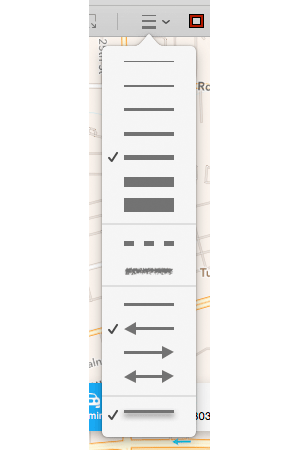 And if the Directions pane appears, close it by choosing View > Hide Directions (Command-R). To capture a picture of the Maps window, press and hold Shift-Command-4 then tap the Spacebar. The cursor changes to a camera, and when you mouse over the Maps window it highlights in blue. Click the mouse button to save a picture of this window as a PNG file on your desktop. Double-click that file to open it in Preview, or drag it onto the Preview app in your dock or in your Applications folder. In Preview, get the Arrow tool by choosing Tools > Annotate > Arrow (Control-Command-A). Then, from the Markup toolbar, click the Shape Style menu and pick a thick line. If the Markup toolbar isn’t showing, choose View> Show Markup Toolbar (Shift-Command-A). From the Shape Style menu, choose a direction for the arrow—if you’ll draw from right to left, pick the left-pointing arrow shown here. Don’t worry about getting it exactly right. You can change the width, direction, style and color later by clicking on the arrow and making new choices from the Markup toolbar. For example, to change the color of the arrow, click the Border Color menu just to the right of the Shape Style menu on the Markup toolbar. 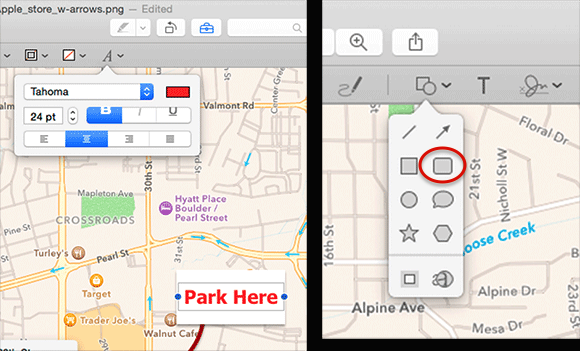 Get the Rectangle annotation tool by choosing Tools > Annotate > Rectangle (Control-Command-R) and drag over the tail of the arrow to make a box. To remove the box’s border, click the top left square in the Border Color menu (circled, left). To fill it with white, use the Fill Color menu (circled, right). Get the Text annotation tool by choosing Tools > Annotate > Text (Control-Command-T). Drag the resulting text box on top of your rectangle and pull the blue dots to adjust its width. Type “Park Here” and click the Text Style menu (below left). Choose a big font such as 24 pt Tahoma Bold and click the color box to set its color. 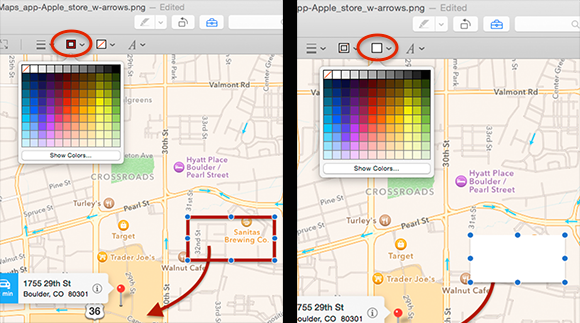 Use the same techniques to add another arrow and rectangle to label the Apple Store, but this time choose a rounded-corner rectangle from the Shapes menu (circled, below right). The Text Style menu (left) and rounded-corner rectangle tool (right). 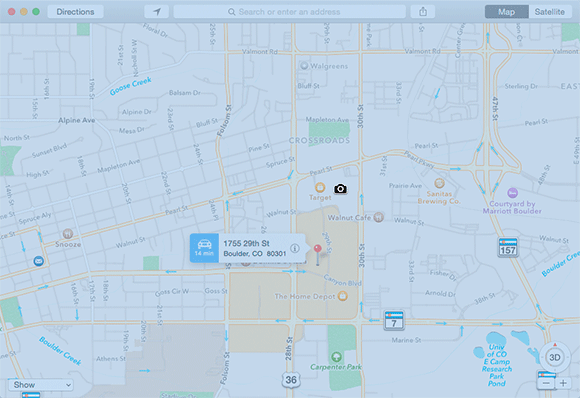 Zoom out and you’ll see the Maps app toolbar is still attached to the top of the map. To remove it, get the rectangular selection tool by choosing Tools > Rectangular Selection and drag it across the area you want to keep. Then choose Tools > Crop (Command-K) to crop out the rest. Select the area to keep. 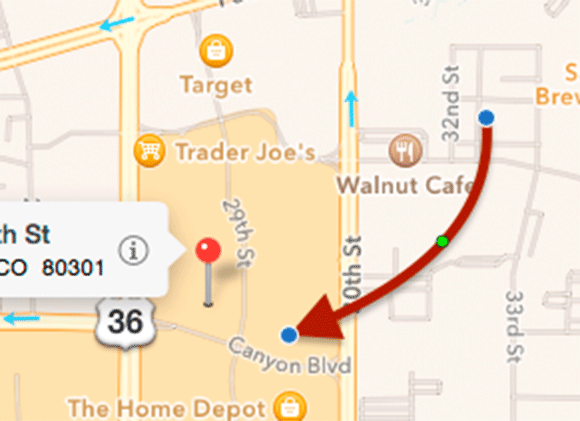 To cover the time-to-destination information in the location flag, choose Tools > Annotate > Rectangle and drag over the blue area. To match the rectangle’s color to the blue in the flag, click the Show Colors button in the Fill Color menu (circled below). The Show Colors button opens the Colors window (second image). Choose File > Save to save your map in PNG format, which is perfect for printing, email or text messages. If you’re super eager to share it, click the Share button. 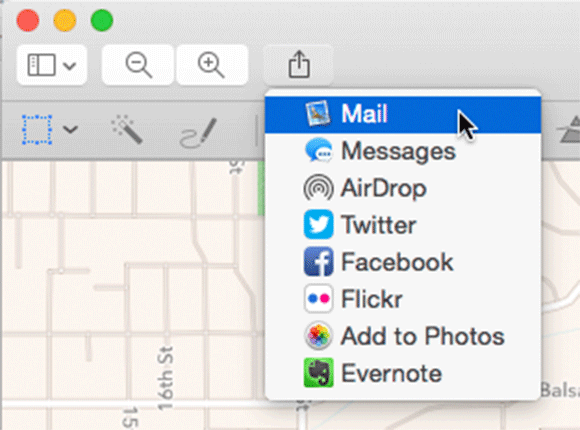 Click the Share button to attach your map to a new email message, send it by text message, or share it via social media. Choose Photos (or iPhoto) to add it to your photo library. With a map like this, your guests are sure to find your event. Until next time, may the creative force be with you all!